Collaborating with others on your timeline is a breeze with Preceden's built-in collaboration features. 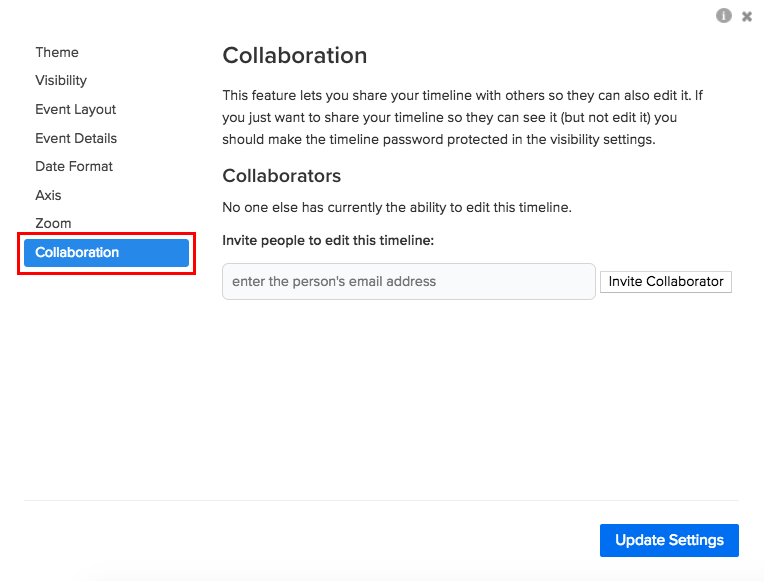 The collaboration features allow you share a timeline with other people so that they can also work on it. We also have a Teams feature that lets you work together with a group of people. 3. Invite someone using their email address. That's it! That person will receive an email with a link that will let them sign up for an account that will have access to the timeline you invited them to. If you'd like to remove that person as a collaborator, click the Delete link beside that person's email address in the collaboration settings. Click Yes and the collaborator will be deleted. Real time updates are not currently available on Preceden, though this is something we'd like to add one day. If you have the timeline open in your browser while your collaborator is making changes on his computer, you'll have to reload your timeline to see his changes and vice versa. You can collaborate with as many people as you'd like. Students can collaborate on timelines in one of two ways. They can share a computer and work on the timeline from the same computer or the teacher (or older students if it is their own account) can upgrade to an account that allows collaboration.